Musical Echoing for Learning French - This brand new and unique method combines the most pleasant and effective elements of the Multiple Intelligences (musical, visual, kinesthetic and linguistic) and the most successful methodologies (chanting, using music, picture reading, TPRS and story telling) to teach vocabulary, sentences, paragraphs and stories in musical -story form. Musical Echoing uses pictures as cues, reinforcements, clarification or memory guides; and specially selected music as a vehicle with which sequences sentences or stories are rhythmically listened to and later chanted. Physical gestures and movements may also be added later. Musical Echoing is good for any age and any level. After using this method for a while you and your students will be able to make up your own stories or synthesize what you read in readers or books in song/chant form. Musical Echoing can be used in beginning and intermediate French classes in elementary, middle school and high school or even adults. All students, be they under – performing or at - level French learners, really love and benefit by Musical Echoing. Many French teachers use Musical Echoing as their main French curriculum, adding more reading and grammar as needed. Others use Musical Echoing as a great addition to their traditional or French TPRS classroom. 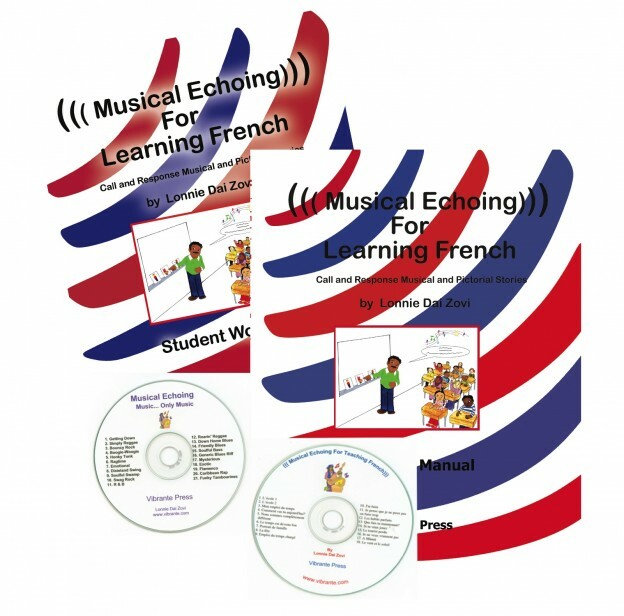 Either way, teachers who use Musical Echoing in their classrooms will see their students quickly and joyfully understand, speak, read and write French in a fun, effective and unique way.